Neil Simon’s classic Tony nominated American play is more relevant today than it might have been 40 years ago when it first debuted on Broadway. “The Prisoner of Second Avenue” is the story of a New York advertising executive who loses his job and then his mind. 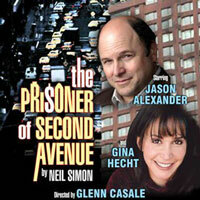 Tony Award winner Jason Alexander offers a performance that is powerful, dramatic and filled with heartfelt hilarity. "...Sound familiar? Except for the burnt-orange pillows on Stephen Gifford’s living room set, you’d never know this play was 40 years old. But we’re here for the laughs, not the sociology, and Alexander has this role in the bag. “Seinfeld” lovers will relish the expert physical comedy the actor delivers in this otherwise straightforward production, briskly directed by Glenn Casale. The unexpected pleasure here is Hecht as Mel’s deeply capable wife. Managing disaster with a steady voice and a self-effacing solution, the actress grounds the play and gives Alexander the base on which to perform his comic pirouettes. " "...Still, it's worth sitting through the disjointed and flat moments to watch Alexander's take on Mel. Many of the biggest laughs come without dialogue, thanks to a variety of facial expressions and wild physicality, as Alexander looks like he's about to explode. The play is as much about the strength of Edna, whose life revolves around her husband's. Hecht displays honest devotion without making Edna seem less important than her husband. Though there's little romance, Hecht, Alexander, and Casale have found the love story in Simon's comedy." "...Mel and Edna Edison may feel trapped in the hell of a 1971 verge-of-collapse New York City, but regardless of whatever 2011 woes audience members bring with them to the El Portal, Jason Alexander, Gina Hecht, and the ever entertaining Neil Simon make sure that all those worries get left at the door. The Prisoner Of Second Avenue proves that, regardless of the decade, laughter is indeed the best medicine." "...Jason Alexander is most notably known for his years as George Costanza on Seinfeld. But his career goes back before that as a Broadway musical performer. He has a wonderful voice and is an excellent actor, has performed in a number of stage productions in Los Angeles as well as directed, and has been the Artistic Director of The Reprise Theatre Company for the past four years. He is absolutely the perfect Mel in this production of The Prisoner of Second Avenue, and Gina Hecht as Edna, is the perfect foil for his character. They play off of each other so well. Director Glenn Casale keeps the momentum and humor running throughout."